What are the different parts of a solenoid valve? The illustration below depicts the basic components of a solenoid valve. The valve shown in the picture is a normally-closed, direct-acting valve. This type of solenoid valve has the most simple and easy to understand principle of operation. 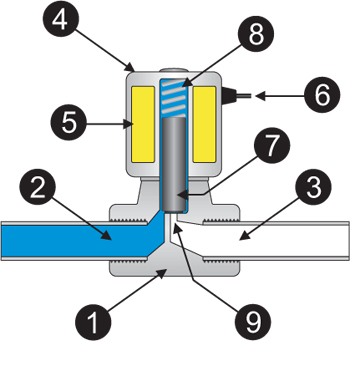 The media controlled by the solenoid valve enters the valve through the inlet port (Part 2 in the illustration above). The media must flow through the orifice (9) before continuing into the outlet port (3). The orifice is closed and opened by the plunger (7). The valve pictured above is a normally-closed solenoid valve. Normally-closed valves use a spring (8) which presses the plunger tip against the opening of the orifice. The sealing material at the tip of the plunger keeps the media from entering the orifice, until the plunger is lifted up by an electromagnetic field created by the coil. The video animation below shows the operation sequence for a direct-acting solenoid valve.